Sisoes was trained as an ascetic with Abba Or in Scetis. 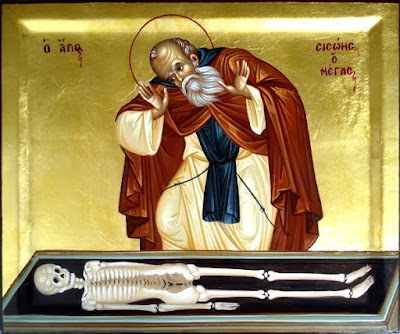 He left Scetis after the death of St. Anthony, saying it had become too popular and settled on St. Anthony s mountain for seventy-two years. He found it deserted. He received supplies from Pispir by a servant and was in touch with Rhaithou and Clysma. He reposed in 429 and is celebrated by the Church on July 6th. 10. One of the inhabitants of the Thebaid came to see Abba Sisoes one day because he wanted to become a monk. The old man asked him if he had any relations in the world. He replied, 'I have a son.' The old man said, 'Go and throw him into the river and then you will become a monk. As he went to throw him in, the old man sent a brother in haste to prevent him. The brother said, 'Stop, what are you doing?' But the other said to him, 'The abba told me to throw him in.' So the brother said, 'But afterwards he said do not throw him in.' So he left his son and went to find the old man and he became a monk, tested by obedience. 12. Abraham, Abba Sisoes' disciple, was tempted one day by the devil and the old man saw that he had given way. Standing up, he stretched his hands towards heaven, saying, 'God, whether you will, or whether you will not, I will not let you alone till you have healed him,' and immediately the brother was healed. 14. It was said of Abba Sisoes that when he was at the point of death, while the Fathers were sitting beside him, his face shone like the sun. He said to them, 'Look, Abba Anthony is coming.' A little later he said, 'Look, the choir of prophets is coming.' Again his countenance shone with brightness and he said, Look, the choir of apostles is coming,' His countenance increased in brightness and lo, he spoke with someone. Then the old men asked him, 'With whom are you speaking, Father?' He said, 'Look, the angels are coming to fetch me, and I am begging them to let me do a little penance.' The old man said to him, 'You have no need to do penance, Father.' But the old man said to them, 'Truly, I do not think I have even made a beginning yet.' Now they all knew that he was perfect. Once more his countenance suddenly became like the sun and they were all filled with fear. He said to them, 'Look, the Lord is coming and he's saying, "Bring me the vessel from the desert." ' Then there was as a flash of lightening and all the house was filled with a sweet odor. 16. Some brothers went to see Abba Sisoes to hear a word from him. But he did not speak to them saying, 'Excuse me.' Seeing his little baskets, the visitors asked his disciple Abraham, 'What do you do with these little baskets?' He said, 'We sell them here and there.' Hearing this the old man said, 'Even Sisoes eats now and then.' By these words the visitors were greatly helped and they returned with joy, edified by his humility. 18. A secular who had a son came to see Abba Sisoes on Abba Anthony's mountain. On the way, it happened that his son died. He was not troubled by this but brought him with confidence to the old man and bowed down with his son, as though making prostration, so that he would be blessed by the old man. Then the father stood up, left the child at the old man's feet and went outside. The old man, thinking that the boy was bowing said to him, 'Get up, go outside.' For he did not know that he was dead. Immediately the boy stood up and went out. When he saw it, his father was filled with amazement and went back inside. He bowed before the old man and told him the whole story. When he heard it the old man was filled with regret, for he had not intended that to happen. So the disciple asked the father of the child not to speak of it to anyone before the old man's death. 24. It was said of Abba Sisoes that when he was sitting in the cell he would always close the door. 25. One day some Arians came to see Abba Sisoes on Abba Anthony's mountain and they began to speak against the orthodox faith. The old man gave them no answer but he called his disciple and said to him, Abraham, bring me the book of Saint Athanasius and read it.' Then they were silent as their heresy was unmasked and he sent them away in peace. 32. They said Abba Sisoes the Theban dwelt at Calamon of Arsinoe. Another old man was ill there in the other lavra and when he heard of it, Abba Sisoes was very sorry. Now Abba Sisoes used to fast for two days at a time, so there was one day when he did not eat. When he heard about the old man's illness, he said to himself, 'What shall I do? If I go and see him, I am afraid the brethren will compel me to eat, but if I wait until tomorrow, I am afraid he may die. This is what I will do; I will go and I will not eat.' So he went fasting, both fulfilling the commandment of God and yet not relaxing his way of life for the sake of God. 33. One of the Fathers related of Abba Sisoes of Calamon that, wishing to overcome sleep one day, he hung himself over the preci- pice of Petra. An angel came to take him down and ordered him not to do that again and not to transmit such teaching to others. 37. They said of Abba Sisoes the Theban that when the assembly was dismissed he used to flee to his cell and they used to say of him, 'He is possessed by a devil.' But he was really doing the work of God. 46. One day Abba Abraham, Abba Sisoes' disciple, went away on an errand. During his absence the old man did not wish to be served by anyone else. 'Shall I let any other man, except my brother, get used to me?' He refused till his disciple should return, and put up with the hardship. 48. One day Abba Sisoes left Abba Anthony's mountain to go to the outer mountain of the Thebaic! and there he stayed. Now there were some Meletians there who lived at Calamon of Arsinoe. Hearing that the old man had come to the outer mountain, some people wished to see him but they said, 'What shall we do because the Meletians are on the mountain. We know that the old man does not suffer harm from them but we are afraid lest, in wanting to meet the old man, we fall into the temptation of the heretics.' So as not to meet the heretics, they did not go to see the old man. 50. They said of Abba Sisoes that when he came to Clysma he fell ill. While he was sitting with his disciple in his cell, someone knocked on the door. Then the old man understood and said to his disciple, Abraham, say to him who is knocking, "I am Sisoes on the mountain and I am Sisoes on my bed." ' Hearing this, the one who knocked disappeared. 52. They said of Abba Sisoes the Theban that he did not eat bread. At the Paschal Feast the brothers bowed to him and invited him to eat with them. He answered them, 'There is only one thing I can do: either I eat bread with you, or else I eat all the dishes you have prepared.' They said to him, 'Eat only bread,' and he did so. 12. They said of Abba Pambo that he was like Moses, who received the image of the glory of Adam when his face shone. His face shone like lightening and he was like a king sitting on his throne. It was the same with Abba Silvanus and Abba Sisoes. 1. Abba Pistus related that which follows: 'We were seven anchorities who went to see Abba Sisoes who lived at Clysma, begging him to give us word. He said to us, "Forgive me, for I am a very simple man. But I have been to Abba Or and to Abba Athre. Abba Or was ill for eighteen years. I made a prostration before him and asked him to give me a word. Abba Or said to me, 'What shall I say to you? Go, and do what you see is right; God comes to him who reproaches himself and does violence to himself in everything.' Abba Or and Abba Athre did not come from the same part of the country, yet until they left their bodies, there was great peace between them. Abba Athre's obedience was great, and great was Abba Or's humility. I spent several days with them, without leaving them for a moment, and I saw a great wonder that Abba Athre did. Someone brought them a little fish and Abba Athre wanted to cook it for the old man. He was holding the knife in the act of cutting up the fish and Abba Or called him. He left the knife in the middle of the fish and did not cut up the rest of it. I admired his great obedience, for he did not say, 'Wait till I have cut up the fish.' I said to Abba Athre, 'Where did you find such obedience?' He said to me, 'It is not mine, but the old man's.' He took me with him, saying, 'Come and see his obedience.' He took the fish, intentionally cooked some of it badly, and offered it to the old man who ate it without saying anything. Then he said to him, 'Is it good, old man?' He replied, 'It is very good.' Afterwards he brought him a little that was well cooked and said, 'Old man, I have spoiled it,' and he replied, 'Yes, you have spoiled it a little.' Then Abba Athre said to me, 'Do you see how obedience is intrinsic to the old man?' I came away from there and what I have told you, I have tried to practise as far as I could.'"